Today, many people wish to buy a phone which is trending and most importantly is equipped with latest features and specs. However, as we all know such mobile phones will be expensive and will be out of reach of the mid-middle class pole. Well, now the time has changed as many mobile manufacturing companies have introduced many midrange mobile phones which are equipped with innovative features and specs. This has now allowed the people from the middle class to own a mobile which is equipped with high end specs and features. The most well-known mobile phone manufacturers which are getting a lot of popularity among the consumers around the world are Huawei and Oppo. Both these smartphone manufacturing companies have recently introduced two new midrange mobile phones by the name of Huawei Y7 Prime 2018 and Oppo A3. The question now arises here is that many people are confused in making the buying decision of both these phones. Most people are confused in which one of these phones they should buy. Well, don’t worry here in this post I am doing a detailed comparison of both these midrange mobile phones by Oppo and Huawei, which will help the consumer make their buying decision effortless. Price is an important feature which is considered on top while buying anything nowadays. The same thing applies here. When we discuss the price of both these phones, Huawei Y7 Prime 2018 price in Pakistan is Rs.25,999, whereas Oppo A83 price in Pakistan is Rs.22,000. If you are not a resident of Pakistan and wish to buy any one of these Huawei mobiles, Huawei Y7 Prime is available at a price tag of 170 EURO, whereas on the other hand, Oppo A83 is available at a price tag of 200 EURO. In Pakistan, Huawei Y7 Prime price in Pakistan is competitive as compared to the 2018 variant introduced by the company. 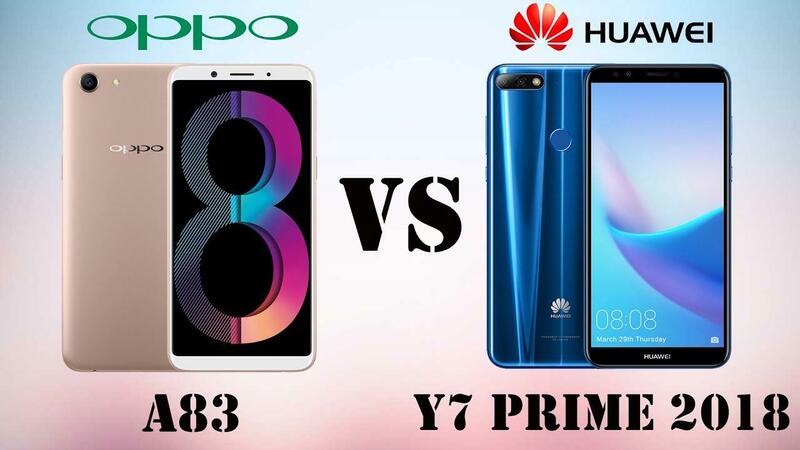 Here we can clearly see that Huawei Y7 Prime 2018 clearly beats its midrange mobile rival Oppo A83 in terms of price. However, if you still need to buy Oppo mobile, you don’t have to worry as many online stores are offering EMI Pakistan facility to their customers. In this consumer can buy expensive mobiles on installments with the ease of buy now pay later basis. Both these midrange mobile phones comes with appealing and attractive display screens. In terms of display size and screen resolution, Huawei Y7 Prime 2018 features an IPS 5.99-inch LCD capacitive touchscreen with 76.3% screen to body ratio. This phone comes with a screen resolution of 720x1440 with an aspect ratio of 18:9 and 269ppi pixel per inch. On the other hand, Oppo A83 comes with an IPS 5.7-inch LCD capacitive touchscreen with 76.2% screen to body ratio. This screen size of this phone comes with a screen resolution of 720x1440 with an aspect ratio of 18:9 and 282ppi pixel per inch. Here we can see that Huawei Y7 Prime 2018 comes with a massive screen as compared to Oppo A83. So, if you are interested in buying a big screen midrange mobile phone simply buy Huawei Y7 Prime 2018. When we discuss about the performance and internal storage availability of both phones, you will certainly not be disappointed. Under the hood of Huawei Y7 Prime, you get to see Qualcomm MSM8937 Snapdragon 430 1.4GHz Octa-Core processor which is coupled with 3GB RAM. This phone comes with 32GB of internal storage which the user have the option to expand it up to 256GB via microSD card. This phone comes with a dedicated memory card slot, which allows the user to use two different network SIMs along with expand internal storage of this phone. When we have a look under the hood of Oppo A83 you get to see Mediatek MT6763T Helio P23 2.5GHz Octa-core processor which is coupled with 2/3/4GB RAM. RAM memory of this phone differ as per the internal storage variant you prefer to buy. It is available in three internal storage variants which include 16/32/64GB. The user can expand the internal storage of all three variants up to 256GB via microSD card. This phone also comes with a dedicated card slot. The 16GB variant comes with 2/3GB RAM while 32/64GB comes with 3/4GB RAM. Huawei Y7 Prime 2018 features a dual 13+2MP rear camera with PDAF, depth sensor and LED flash. The rear camera of this phone comes with HDR and panorama features. At the front, you get to see 8MP front selfie shooter with LED flash. As far as Oppo A83 cameras are concerned, it comes with a 13MP rear camera with autofocus and LED flash. At the front of this Oppo mobile, you see an 8MP selfie shooter. Huawei Y7 Prime 2018 is running on the latest Android OS version Oreo v8.0, while Oppo A83 runs on previous version Nougat v7.0. Huawei Y7 Prime 2018 is powered with 3000mAH non-removable Li-Ion battery, which gives it 16-18hrs standby time. This phone is available in three appealing colors which are Blue, Gold and Black. On the other hand, Oppo A83 is powered with non-removable Li-Ion 3180mAH battery. It is available in four appealing colors which include Red, Blue, Black and Gold.